In another article published directly after 7/7 – in the labour movement magazine Tribune of all places – Namazie condemned “the futile and ongoing support for a ‘moderate’ Islam”. And she quoted the WPI’s founder Mansoor Hekmat as saying that Islam does not include “a progressive, supportable faction”. Far from limiting itself to “legitimate criticism of Islamism”, the WPI has in fact persistently blurred the distinctions between Islam and political Islam, and between reformist and extremist tendencies within Islamism itself. Their propaganda does indeed constitute an attack on “the whole of Islam”. OLFA’s anti-Sharia campaign is a case in point. The reality is that 95% of the work of Sharia councils is concerned with matrimonial issues – mainly applications for a religious divorce by women trapped in failed marriages from which their husbands refuse to free them. In that regard, Najma Ebrahim of the Muslim Women’s Helpline has described such councils as providing a vital service. In addition, the Muslim arbitration tribunals which also base their rulings on Sharia, and have been set up entirely legally under the 1996 Arbitration Act, deal with disputes over commercial and civil issues. Yet the WPI and OLFA have systematically misrepresented these institutions as part of an aggressive expansionist project by political Islam. Enemies Not Allies tells us: “The establishment of Sharia law in Britain is a direct result of Islamism…. Sharia law is fundamentally the demand of Islamic states and the political Islamic movement to limit citizens’ rights.” And in case you were wondering why OLFA’s propaganda is directed exclusively against Sharia councils and ignores the Beth Din courts that operate along similar lines within the Jewish community, Enemies Not Allies explains that, while “Sharia is no different from other religious laws, its adverse effects on people’s lives are more widely felt due to the growth of Islamism’s political power”. Here again, a mainstream religious practice, the wearing of the Islamic headscarf (and despite her reference to the “veil” Namazie’s target here is the hijab rather than the niqab) is portrayed as part of some plan by “the political Islamic movement” to impose its will on society – “the same movement”, Namazie helpfully explains, “that has blown up innocent people on buses, cafes and in office buildings across the globe”. And in addition to being linked to terrorism, the broad section of Islam that regards the hijab as a religious requirement is compared directly to Nazism. Mainstream individuals and organisations within the Muslim community have been subjected to the same hysterical denunciations by Namazie. Addressing the annual meeting of the Peter Tatchell Human Rights Fund in 2006, she attacked Sir Iqbal Sacranie, the then secretary general of the Muslim Council of Britain, in the following terms: “He may be a ‘Sir’ but he is still a proponent of political Islam, the fascism of today.” In a speech at a meeting to mark the International Day Against Homophobia in 2007, Namazie claimed that the only reason the MCB isn’t killing homosexuals is that they do not hold state power and therefore “cannot mete out their Islamic justice with hangings in Trafalgar Square”. It is difficult to see how this rhetoric differs in any way from the sort of raging bigotry you might hear from the EDL, the BNP, SIOE or Pamela Geller. Does anyone seriously buy the argument that such frothing-at-the-mouth Islamophobia comes under the heading of “legitimate criticism of Islamism”? It is not surprising, therefore, that the WPI and its initiatives have been favourably received by the Islamophobic right. They may have fallen out now, but Namazie was once hailed by Robert Spencer for her denunciations of “Islam-stricken societies” and her warnings about the threat that political Islam poses to the West. When Namazie was interviewed by the Times in 2008, Jihad Watch congratulated her on a “powerful statement of why Sharia is incompatible with Western standards of justice and human rights”. OLFA’s 2009 anti-Sharia demonstration in London was publicised by Jihad Watch, and only last year Spencer’s website recommended an article that Namazie wrote for the Guardian promoting the OLFA publication Sharia Law in Britain. The formation of One Law For All was itself applauded at FrontPage Magazine by Deborah Weiss of Vigilance Now, who argued that a victory for OLFA’s campaign against Sharia councils would be “a statement to those who hold a radical political ideology cloaked in the name of Islam, that Britain stands for freedom and equality, and will not appease those who seek to subvert it”. FrontPage Magazine is run by the David Horowitz Freedom Center which is also the main source of funding for Jihad Watch. While the WPI balks at accepting the EDL’s offer of co-operation, that doesn’t mean Namazie and her comrades reject joint work with other sections of the Islamophobic right. A featured speaker at OLFA’s Enemies Not Allies seminar earlier this year was Douglas Murray, director of the Centre for Social Cohesion – billed by OLFA as “a non-partisan think-tank” whose purpose is to “promote human rights, tolerance and greater cohesion among the UK’s ethnic and religious communities and within wider British society”. In fact the CSC is a right-wing propaganda organisation which has played a prominent role in what the recently published Spinwatch study describes as “the Cold War on British Muslims”. Unsurprisingly, given her views on the threat posed by Muslim communities in the West and her support for Israel as a bulwark against Islam, Cox is a great admirer of the Dutch far-right racist Geert Wilders. 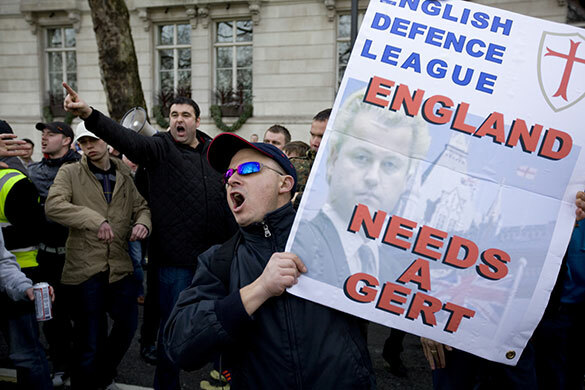 In 2010 she and the then UKIP leader Lord Pearson notoriously invited Wilders to show his Islamophobic film Fitna at the House of Lords, while the EDL demonstrated outside in support of Wilders, brandishing placards reading “England Needs a Gert”. Not that the WPI has any problem working with Wilders’ allies. In 2007 a Dutch Labour Party politician named Ehsan Jami co-wrote an article with Wilders for the daily paper Volkskrant, in which they argued: “If we do not act now against the far-reaching Islamisation of the Netherlands, then the 1930s will be revived. The only difference is that back then the danger came from Adolf Hitler, while today it comes from Mohammed.” Quite rightly, the Labour Party expelled Jami, who subsequently joined Wilders’ PVV. Yet, when Namazie and her Council of Ex-Muslims held an international conference on “Political Islam, Sharia Law and Civil Society” in 2008, that didn’t prevent them inviting Ehsan Jami as a speaker. Wilders is a close ally of Robert Spencer and Pamela Geller, whose anti-Muslim politics Enemies Not Allies devotes many pages to exposing, and he was the star international speaker at SIOA’s “Ground Zero Mosque” protest in September 2010. Wilders compares the Qur’an to Mein Kampf and describes mosques as “palaces of hate”. When he spoke at the House of Lords at the meeting co-hosted by Baroness Cox, Wilders used the opportunity to set out his view that all Muslim immigration into Europe should be stopped on the grounds that Islam is a “totalitarian … fascist ideology”. In other words, Wilders is a clear example of the “new form of reaction” identified by the authors of Enemies Not Allies, which “demonstrates extreme xenophobia, bigotry and paranoia concerning Muslims and immigrants”. And the WPI certainly has no illusions about what he stands for: “Geert Wilders as a right-wing politician has got his own agenda, which is to blame most of the problems in Dutch society on immigrants and to label them with the mark of Islam.” Yet Enemies Not Allies omits Wilders entirely from its study, even though as an elected politician who heads the third largest party in the Dutch parliament he exercises far more influence on a European and international level than the EDL, BNP or the minuscule SIOE. And the reason for this omission is obvious. In OLFA the WPI finds itself in a bloc with one of Wilders’ leading British sympathisers, namely Baroness Cox. If OLFA spoke out against Wilders, then the WPI’s anti-Sharia alliance with Cox would collapse. So the authors of Enemies Not Allies loudly proclaim their opposition to a reactionary movement that uses criticisms of Islamism to pursue a right-wing anti-migrant agenda, but they remain silent about the role of the leading European figure in that movement. In short, like most of the WPI’s initiatives, Enemies Not Allies is a fraud. The fact is that the WPI’s anti-Islam propaganda has actively assisted the very anti-migrant racists they say they oppose. If Islam does indeed provide a rationale for terrorism, as the WPI claims, does it not follow that communities of migrant origin who adhere to that faith must pose a threat to the European societies they live in? The WPI’s obsessive conviction that the “political Islamic movement” is behind everything from the hijab to Muslim arbitration tribunals similarly feeds paranoid right-wing fantasies about an Islamist plot to conquer the West. Understandably, the anti-Muslim right has repeatedly applauded the WPI’s initiatives, while the WPI for its part happily forms alliances with sections of the anti-Muslim right in order to pursue their common Islamophobic agenda. And now, with the publication of Enemies Not Allies, the WPI tries to present itself as a principled opponent of the same right-wing movement to which it has provided such effective assistance over the years. You might ask whether it is worth paying so much attention to an obscure political sect like the WPI. But the group has exercised some influence in the recent period, with Namazie emerging as a minor media personality. Her profile was raised in 2005 when she won the Secularist of the Year award, which resulted in a gushing profile by Nick Cohen in the Observer. In 2006 she was one of a dozen prominent figures who signed a statement denouncing Islamism as “the new totalitarianism”. Namazie has been interviewed by the Times, and she has written for the New Statesman and the Guardian – liberal publications that would draw the line at allowing an anti-Muslim right-winger to attack Islam in the way that Namazie does. The WPI therefore plays a not insignificant role in providing a “progressive” cover for the prevailing right-wing Islamophobic discourse. 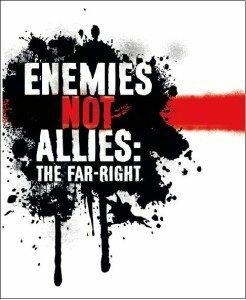 The publication of Enemies Not Allies has at least offered an opportunity to expose the irrationality and hypocrisy of this poisonous little gang of pseudo-leftists.